Not to be confused with asymptotic. Pulmonary contusion due to trauma is an example of a condition that can be asymptomatic with half of people showing no signs at the initial presentation since such symptoms can take time to develop. 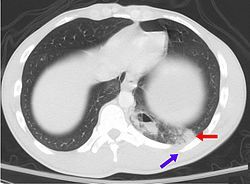 The CT scan shows a pulmonary contusion (red arrow) accompanied by a rib fracture (purple arrow). In medicine, a disease is considered asymptomatic if a patient is a carrier for a disease or infection but experiences no symptoms. A condition might be asymptomatic if it fails to show the noticeable symptoms with which it is usually associated. Asymptomatic infections are also called subclinical infections. Other diseases (such as mental illnesses) might be considered subclinical if they present some but not all of the symptoms required for a clinical diagnosis. The term clinically silent is also used. It may develop symptoms later and so require watch and wait or early treatment. It may resolve itself or become benign. It is required that a person undergoes treatment so it does not cause later medical problems such as high blood pressure and hyperlipidaemia. Be alert to possible problems: asymptomatic hypothyroidism makes a person vulnerable to Wernicke-Korsakoff syndrome or beri-beri following intravenous glucose. The affected person may be infectious and unknowingly spread the infection to others. An example of an asymptomatic disease is Cytomegalovirus (CMV) which is a member of the herpes virus. "It is estimated that 1% of all newborns are infected with CMV, but the majority of infections are asymptomatic." (Knox, 1983; Kumar et al. 1984) In some diseases, the proportion of asymptomatic cases can be important. For example, in multiple sclerosis it is estimated that around 25% of the cases are asymptomatic, being these cases detected postmortem or just by coincidence (as incidental findings) while treating other diseases. Asymptomatic conditions may not be discovered until the patient undergoes medical tests (X-rays or other investigations). Some people may remain asymptomatic for a remarkably long period of time; such as people with some forms of cancer. If a patient is asymptomatic, precautionary steps must be taken. A patient's individual genetic makeup may delay or prevent the onset of symptoms. Some diseases are defined only clinically, like AIDS being opposed to HIV infection. Therefore, it makes no sense to speak about "asymptomatic AIDS". This concept of clinically defined diseases is related in some way to the concept of syndrome. These are conditions for which there is a sufficient number of documented individuals that are asymptomatic that it is clinically noted. For a complete list of asymptomatic infections see subclinical infection. ^ Tattersall, R (2001). "Diseases the doctor (or autoanalyser) says you have got". Clinical Medicine. London. 1 (3): 230–3. doi:10.7861/clinmedicine.1-3-230. PMID 11446622. ^ Watson, A. J.; Walker, J. F.; Tomkin, G. H.; Finn, M. M.; Keogh, J. A. (1981). "Acute Wernickes encephalopathy precipitated by glucose loading". Irish Journal of Medical Science. 150 (10): 301–303. doi:10.1007/BF02938260. PMID 7319764. ^ Engell T (May 1989). "A clinical patho-anatomical study of clinically silent multiple sclerosis". Acta Neurol Scand. 79 (5): 428–30. doi:10.1111/j.1600-0404.1989.tb03811.x. PMID 2741673.